Quarterback sacks have been recorded since the 1960s, but no credit was given to individual sack totals until 1982. One of the league’s greatest quarterback sack-masters was Deacon Jones, but because the league did not tally individual sacks during his career, Jones’ 26 sacks in the 1967 season is known only as an ‘unofficial record’. The New York Giants’ legendary defensive end (and current talk-show host) Michael Strahan holds the official record for 22.5 sacks in one season. In case you’re curious, a sack can be split in half and each half awarded to a different player if it is unclear who reached the quarterback first. 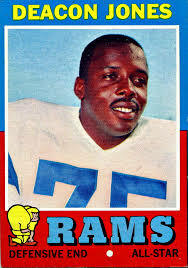 Deacon Jones looks friendly, but he terrorized quarterbacks. 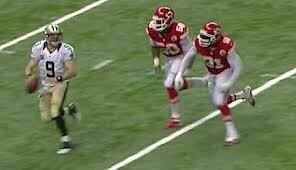 Remember the Kansas City Chiefs? The team that finished with 2 wins and 14 losses last season? Well they are currently 6-0, and they play some pretty impressive defense these days. For example, this past weekend, the Chiefs recorded 10 sacks against Terrelle Pryor and the Raiders, which is two shy of the record for team sacks in a game. That brings them to 31 for the year, 9 more than the second-place Baltimore Ravens. Also, they are my fantasy football team defense, and netted me an astonishing 26 points against fellow Same Page contributor Ian Clark’s squad, Blue Flutie-Two. (Side Note: Ian is not a big football guy. In consecutive weeks, he called his starting quarterbacks Colin Fitzpatrick and Jay Cuthbert). GO MEN IN TIGHTS!! Justin Houston and Tamba Hali are the starting outside linebackers for the Chiefs, and they are destroying pass blocking schemes all around the league. 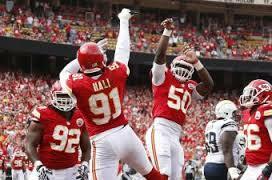 Houston is currently tied for first in the league with 9.5 sacks, while Hali sits third with 7.5. So how are they doing it? “Uh,is it too late to call a timeout?” – Drew Brees. First of all, new head coach Andy Reid and his defensive coordinator Bob Sutton are huge fans of blitzing the quarterback. This works for the Chiefs, and not always as well for other teams, because they happen to be stacked with defensive All-Pros in Brandon Flowers and Derrick Johnson at cornerback and inside linebacker, respectively. So on any passing play, a quarterback has to worry about their receiver being extremely well covered by Flowers and the rest of the Chiefs secondary, while any short, safe passes are subject to the superb tackling ability of Derrick Johnson. This is not a luxury that every team has, and it allows Reid and Sutton to deploy their rushing linebackers to a higher degree than most other teams. The Baltimore Ravens feature two excellent pass-rushing linebackers also in Terrell Suggs and Elvis Dumervil, but they do not have a defense to match the Chiefs, and often have to assign either Suggs or Dumervil to pass coverage, which softens the pass rush considerably. So the Chiefs employ a specific system and feature a combination of defenders that allows them to blitz with impunity. But that’s only half the story. The art of the pass rush demands a great deal of the athletes involved. Hali and Houston are football’s best partnership since beer and wings. The proper blitz requires a sublime ability to react immediately to the snap of the football. This is a skill that sometimes takes years to hone, and some the best athletes in the game never figure it out. Hali and Houston seem to have it down to a science, and have no trouble reacting quickly and explosively. The blitzers are usually met with an offensive lineman or tight end, and have to somehow get around them before even getting a chance to hit the quarterback. In this GIF, Houston uses a shoulder juke, similar to something a running back might do to avoid a tackle, to beat the offensive tackle and reach Drew Brees. Watch here as Hali also reacts immediately, then smartly makes the decision to follow his assignment, Pryor, rather than react to the play-action and chase the running back. This is another part of the equation. A defensive player’s instinct is to find the ball carrier and bring them down, which is why the play-action is such a vital part of every team’s offense. Many times in that situation, pass rushing outside linebackers hesitate, or decide to chase the running back, an action that affords the quarterback time to complete a pass. In the play above, Hali does seem to hesitate, but recovers quickly enough to make the sack. One thing that stands out to me is that the Chiefs are getting pressure on the quarterback, even though teams are adjusting to maximum protection schemes. Check out this sack from Sunday, where Hali (91) annihilated a hapless blocking tight end and dragged down Pryor for a 12-yard loss. The Raiders could not stop the rush of Hali and Houston, even though they added extra blockers and removed receiver options. That last part is the most impressive, and most intimidating, part of the story. By week 6 of the season, teams know what’s coming. They know Hali and Houston are bringing pressure off the edges, and still they have not figured out a way to stop them. The Raiders tried to add blockers to the edges, but that plan had two flaws; For one, it removed receiving options, forcing the quarterback to hold the ball longer, which gave the linebackers more time to reach him. For another, it simply did not work. Hali and Houston repeatedly ran around, through, and over anybody in their way on Sunday. The Chiefs should continue to rack up quarterback sacks, at least for the next three weeks. They next face the crumbling Houston Texans, who have a solid rushing game but have had trouble protecting Matt Schaub and TJ Yates under centre. The game to circle is week 11’s matchup with Peyton Manning and the Denver Broncos, which is a division rivalry, could be a battle of unbeaten teams, and features the league’s most intimidating defense against the league’s most intimidating offense. 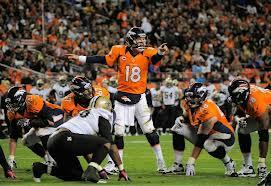 Peyton Manning sees things before they happen. The NFL is a league of creative thinkers and innovators, so eventually someone will come up with a way to slow this outrageous two-pronged pass rush. Some possible solutions are adding backfield blockers, running shorter receiver routes, and using a variety of snap counts. Manning is a wizard at identifying blitzes and counteracting them at the line, but he’ll have to be at his analytical zenith against the Chiefs to keep Houston and Hali off his back. Until anyone does figure it out, the Chiefs will continue to run amok through out the league, and, hopefully, Men In Tights will continue to tear through the Same Page’s Fantasy Football League. GO MEN IN TIGHTS!! !